Rising health care costs have outpaced the incomes of Massachusetts families over the past decade, despite efforts by the state to control medical expenses, according to a report released Wednesday. 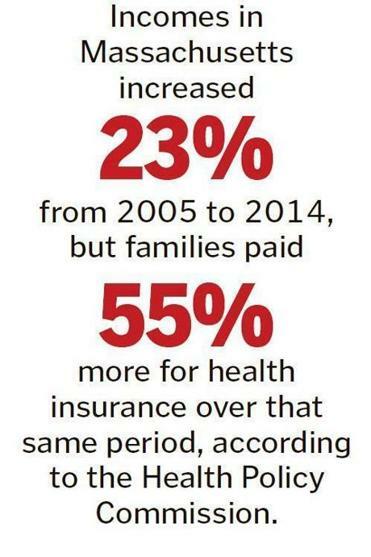 The cost of health insurance grew at twice the rate of incomes, jumping 55 percent from 2005 to 2014, compared to 23 percent for income, according to the report from the Health Policy Commission, a state watchdog agency that monitors health spending. Health insurance costs averaged $19,300 per family last year, consuming about one-fifth of the average family income of $88,000. For many Massachusetts residents, the costs of care are unaffordable, the report said. About 17 percent of residents reported forgoing medical care because of the high expense. Lora M. Pellegrini, chief executive of the Massachusetts Association of Health Plans, which represents health insurers, said the study shows hospital prices and drug prices continue to drive up costs. Prescription drug spending grew 13 percent in Massachusetts last year, and 12 percent nationally. Much of that increase was tied to new, high-cost drugs, including the blockbuster hepatitis C drug, Sovaldi. But some generic drug prices are also increasing. Dr. David Torchiana said insurance premiums represent 18 percent of median household income in Mass., but 21 percent of income for households across the US. 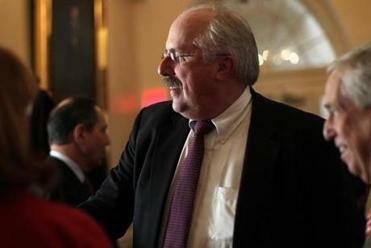 “We know the cost of health care is a challenge in Massachusetts,” Pellegrini said. The commission’s annual report covered various areas of the health care industry, from prescription drug costs to insurance trends to emergency department visits. The analysis provided more evidence of significant price variation at Massachusetts hospitals and showed that big, expensive hospital systems are getting more business. Higher-priced hospitals continued to receive a “disproportionately high” share of admissions and revenues, the report said. The report noted one common medical issue, pregnancy, and named Massachusetts General Hospital, Brigham and Women’s Hospital, and Newton-Wellesley Hospital as having the highest costs for providing care. All three are owned by Partners HealthCare of Boston, the state’s largest health system. A recent study by Attorney General Maura Healey found that Mass. General and Brigham and Women’s, among the most expensive hospitals in the state, account for nearly 1 in every 5 hospital stays for patients with commercial insurance in Massachusetts. Partners executives have said their higher costs fund their commitment to providing exceptionally complex care, conducting biomedical research, and training future doctors. But they are working to control costs, for example, by moving to new payment contracts that encourage their doctors to reduce unnecessary hospital stays and medical services. Partners and other big health systems are gaining more referrals from primary care physicians, the report said. In 2014, 74 percent of primary care doctors were affiliated with a large health care network, up from 65 percent in 2010. The state’s other large hospital systems include Steward Health Care System and Beth Israel Deaconess Medical Center, both of Boston, UMass Memorial Health Care of Worcester, and Lahey Health of Burlington. Procedures such as colonoscopies and MRIs that were previously provided at lower-cost clinics are moving to more expensive hospital-run facilities, the report said. Stuart Altman, chairman of the commission, called this a “troubling trend” that is driving up spending. Lynn Nicholas, chief executive of the Massachusetts Hospital Association, said hospitals have taken many steps to control costs. She said replacing the traditional fee-for-service payment system, which rewards providers for the number of procedures they do rather than the quality of care they provide, is critical to reducing costs. “The greatest potential catalyst to [cost control] is moving away from fee-for-service to alternative payment models,” she said. State law sets a target of keeping health care spending increases to 3.6 percent a year, but that effort continues to face many challenges. After years of slow growth, overall health care costs are rising faster again. For example, health insurance premiums for Massachusetts individuals and small businesses will climb an average of 6.3 percent in January 2016, more than double the increase in January 2015.